Diabetes-associated vision loss is the most common cause of blindness among working-age people. It is caused when the formation of new blood vessels in the eye leak into the light-sensing retina. William Hauswirth hopes to correct this, along with other causes of blindness and eye disease. Hauswirth, a professor of molecular genetics, holds appointments in the Departments of Ophthalmology and Molecular Genetics and Microbiology. 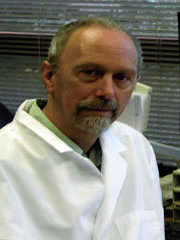 “His area of expertise is molecular genetics with his lab focusing on developing clinical applications for gene-based therapies for blinding diseases of the retina,” says William Driebe Jr., interim chair of the Department of Ophthalmology. Another part of Hauswirth’s research addresses diseases of the central retina (or the macula), which affect two to five million people and are the major cause of age-related and heritable blindness in the United States. “Using a mouse model of Stargardt’s disease (the most prevalent form of inherited macular dystrophy), we deliver a normal copy of the Stargardt’s gene to test the idea that simple gene replacement can slow or reverse this form of macular degeneration,” Hauswirth says.